The biggest reason is because my wife and I have a passion for log cabins. We love the way they look, we love to vacation in them and we love the seclusion you can find in the great outdoors. Really, there isn't anything better than staying in a log cabin in the woods. We LOVE log cabins. The second best reason I can think of as to why I built this site is because, life is too great to spend it working for someone else. Because I built this web site as one of our several sources income, we recently were able to take a trip to the mountains of northern Georgia with our friends and I didn't have to ask a boss when I could go. Of course, I had to clear it with the chief standing next to me. (She's the second to last on the right. That's me with her.) 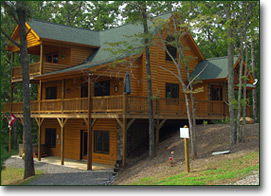 But the point is, Vacation-Cabin-Rental.com was born out of our passion and now it's providing a good part of the income that allows us to vacation in a log cabin whenever we want. Pictured to the left here is the cabin we stayed in August 2005 for a week. It was just across the border from Georgia in Cherokee County, North Carolina. The cabin was a wonderful 3 bedroom 3 bath tri-level. It came complete with a hot tub, a game room on the bottom floor, 2 TV's with Direct TV, 2 fireplaces, our own private balcony on the top floor. The best part about it however, was that it was so secluded we only saw one other vehicle come down our road the entire time we were there. Following our passion has allowed us to do something I never thought possible. We can now work from home and enjoy life on our own terms. So what's the secret to being able to do this. Well, having a passion and being able to work hard is the first and most important part of the secret. The second part is having a system that allows you to carry out your passion, build a business and put it on the net. Nothing is easy however and if you don't have that passion and are only looking for a quick buck on the net then you probably won't succeed. But, if you want to build a stable business and are willing to work hard, Site Build It! is the system that allows your passion to shine through. What is Site Build It! Site Build It! (SBI) is the complete web solution for small to medium sized web businesses. Everything you need to get your business on the web and thriving is included in SBI. Well, except for the passion. Suppose your passion isn't log cabins, maybe it's cats, or art, or hang gliding, or some other avenue of travel besides cabins. That's okay because SBI can help you do whatever kind of business you want to start on the net. Let's just suppose however that you do want to start a business on the web but you only have a budding passion and you're not sure what you want to do. That's okay because SBI has a web site that shows you 400 different examples of sites that are in the top 3% of all web sites on the net. It's a great site for brainstorming and picking up a few ideas for your own budding passion. Once we decided we wanted to build a web business our hunt was on to find out just how to do that. After scouring the net for several months we decided to go with Site Build It. Frankly, there wasn't really any competition when it came to getting a complete system for our web business. Heck, the documentation alone is worth the price of admission. Really, if you want to start a business on the web SBI is the only way to get there. I have to share one more photo from our last trip to north Georgia because it gives a good picture of what it's like to be free from the constraints of a job. 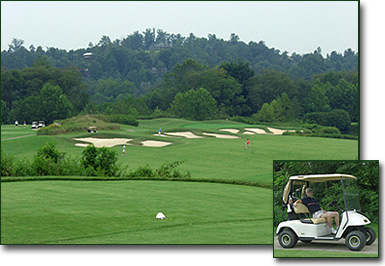 On a Thursday morning at 9:00 am I was on one of the most beautiful golf courses in the south-eastern United States. I wasn't golfing, (I don't golf, that would be dangerous for others on the golf course) but I was enjoying some of the most beautiful scenery you can imagine, hanging out with my buddy Steve and enjoying life. I even got to drive the golf cart most of the day. 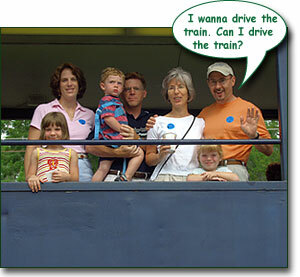 Maybe that's because my buddy knew there was no chance of me getting to drive the train a few days later. Following our passion has allowed my wife and I to enjoy the things we want out of life on the schedule we determine. How about you? What's your passion? What would you rather be doing instead of working for someone else? Don't work for a living, find your passion!